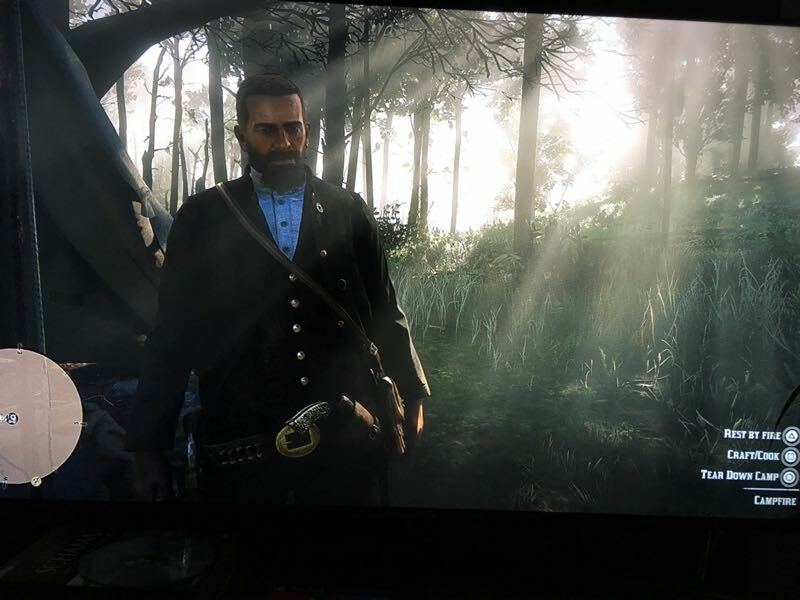 Red Dead Redemption 2 has sucked me in. I’m a recent re-convert to console gaming. In my 20s I had an X-box and played Halo and Rock Band (see this post here for rocking-out awesomeness and me with hair) with friends round at my house with pizza and beers. Then I entered my 30s, coupled up, and the gaming largely stopped. A year ago I bought an X-Box wanting to play The Last of Us, the zombie epic. I played a little, but struggled with the 1st person controls and couldn’t kill the zombies. I also bought The Witcher, but I struggled with that even more. A year passed, and Su suggested we buy Overcooked, a great fun little cooperative cooking game that we binged on until carpal tunnel set in for us both. Then I saw the ads for Red Dead. I saw the reviews. Even though I’d bought Grand Theft Auto games before, and never played the campaign, something about this struck me differently. Number 1, it looked gorgeous. Nobody would say that about the GTA franchise, I think. If I want to go run around in a city, I can do that right now. Crime in that world doesn’t interest me. But in the Old West? I bought it. I played it. I love it. Last night, in a 50-minute play session before the Apprentice, I set off to find an old gunslinger who I needed to interview for some guy who’s writing a book. I didn’t make it that far – first I got stopped by a guy in the bushes who’d got his leg stuck in a trap. I saved him. Then I got bucked off my horse when a crocodile attacked, as I entered a swampy zone. I killed the croc and skinned it. Then I found that I was Legendary Boar territory, so I hunted the boar through its dung for a while, killing it with Deadeye triple shots to the head. I skinned the boar, and finally found the trapper who will buy skins off me. Made a quick buck. 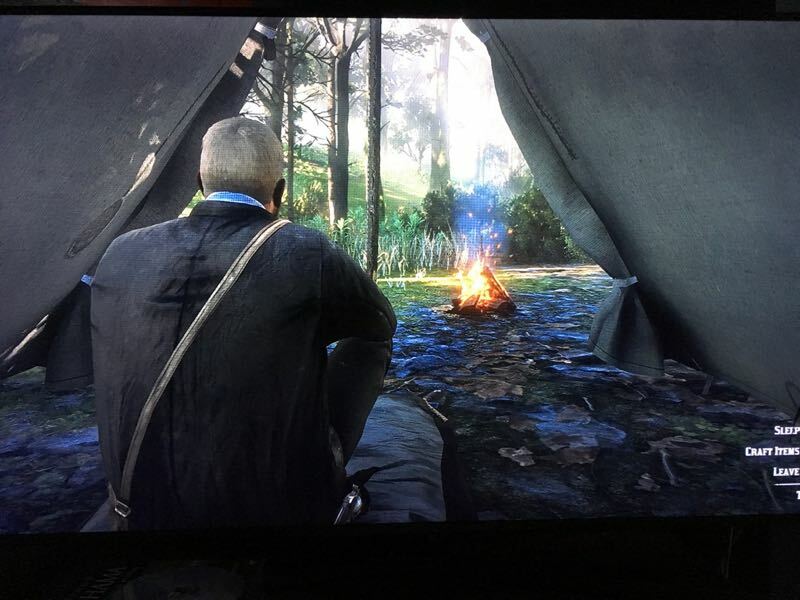 I settled down to end my play session in my own portable campsite, then two guys from Mulbray gang (or some such) interrupted my repose, holding a gun to my head and warning me to stay out of their territory. They congratulated themselves and started off, but I stood up and shot them both in the head. All that in 50 minutes. Oh, I also attacked a prison stagecoach because the woman inside was screaming for help, but didn’t take it out and instead got hunted by two bounty hunters, whom I managed to also kill. Me inside my tent. I got a skinhead haircut (like my hair) but it grows out fast. What game can compare to all that? When Su and I play Diablo (which we haven’t done for ages) there is no real story going on. No events. We go somewhere and mash the same combination of buttons with no fear of death. That takes 50 minutes. We do it again. Again. It’s so repetitive. There’s no skill. The skill in Red Dead is apparent. I’m not good at shooting, so when I get a headshot it’s fantastic. Red Dead rewards me with slo-mo of my target recoiling. I also often die. So there is mastery to be had here. But unlike The Last of Us, I’m never trapped into an encounter in which I can’t prevail. I have only had to re-try action scenes a max of three times before I can get it. There is a learning curve, and its rewarding, not punishing. For example, I stole another stagecoach full of oil (really a big barrel on wheels) from a refinery and got shot up but escaped. 10 minutes later I got hunted down by the refinery guards and died. It took 3 more times to steal it without dying, take a wide route away from the hunters, and get to a place to hide it away. That was fun. That was rewarding. And it’s always unique and different. Me with goatee beard and fantastic waistcoat. And look at that soft light. That light moves and shifts effortlessly, changing as I move and and the sun moves. And I’m not even mentioning half of the best stuff. The graphics are an obvious draw. They are fantastic. Maybe I’m easily awed since I’ve not played a game like this since my World of Warcraft days, but I am awed by this. The sweeping vistas are stunning. Huge expansive plains, craggy mountains in the far distance, canyons, rivers, skies. The weather is always changing, and the light changes dramatically as clouds pass overhead, as rain sets in, as the sun beats down. At night the prairie is beautiful and the skies gleam with stars. The close-up details are also mind-blowing. The depth of every 3D rendered object, person and thing is amazing. A can of beans looks like a can of beans. A gun looks like a gun and is easily distinugishable from a dozen other models, and from one with rust, from one that’s dirty. Trees and grass and leaves are impeccable. When I walk in the mud or in the snow, I leave footprints that perfectly match my feet. when I kill a crocodile on the edge of the bayou, it slaps down into a crocodile-shaped hole in the mud. When I skin an animal, I see all the muscle and fat the remains on the carcass. It’s pretty gross. My clothes get dirty after I get knocked in the mud and I have to take a bath. My hair and beard grow. There are countless outfits I can wear. Eyes glint in the light and move convincingy. It is such a vastly conceived and executed world. If I was playing with a VR-headset it would feel basically real. One of countless stunning vistas. It just looks real. That is one of the three major legs to the stool of why Red Dead is awesome. The first leg is that it’s so much fun to play, packing a wide range of events into every play session. Thirdly though is the people. I titled this article – ‘I feel guilty when I don’t play’. I think this is the game’s signature achievement – making me feel part of my family/gang of misfit criminals. I’ve never felt that before from a game. Maybe a book. I’ve played GTA and never seen it as more than a chance to race around evading the cops. 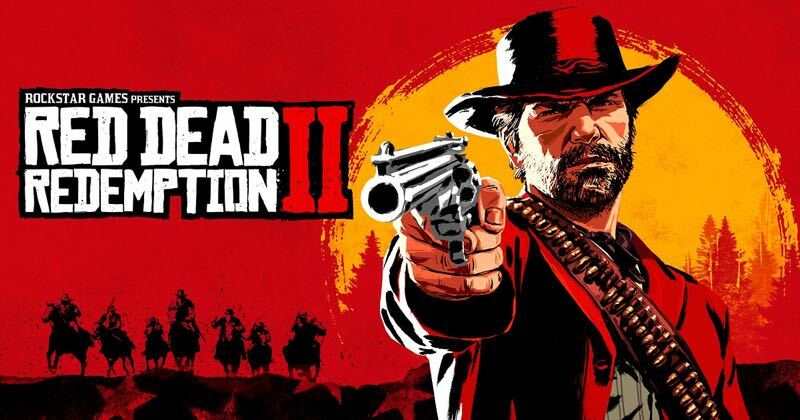 But Red Dead 2 has me sucked right in, caring about these people. Part of the genius of this is the 2-hour or so opening tutorial. The gang’s in the mountains, fleeing our last job that went wrong in Blackwater. We don’t know much at this stage – there’s no scrolling narration to explain. Just what people around us say and what my guy writes in his journal. First up, I’m astonished to see that my gang is like a family. This is not like GTA. There are older men and women, and younger ones, and children too. They seem normal. When we stumble on another gang ravaging a town house, we save the widowed wife and she joins our gang. She’s treated with respect. I quite like these people. Of course, we are also criminals. Some people we kill without thinking about it. But this is the life we’re in. Look at that dirt in the track. I zoomed right in. It looks like real dirt!! In this first 2 hours we spend a lot of time getting to know the gang leader, Dutch, and our predicament. The weight on his shoulders is obvious. Getting older, he longs to get enough money to settle down, buy some land for the gang and make a life. The Blackwater job was supposed to achieve that, but we failed. After the 2 hours hiding in the mountains, we set up a new camp in a forest near the town of Valentine. All my gang are in the camp, though a few are spread out looking for jobs/capers. I can walk around camp and talk to everyone multiple times, and they all have different things to say. Sometimes they’re already talking to each other about something, and I can join in. They wander around, get stew, ask for things like a pen or a book. I get sent on quests. Every time I come back from a quest, or even just an outing, everyone has new dialogue loaded up. Their lives move forward along with mine. Conversation never repeats. They have new topics for me, for each other. Sometimes the quests are totally frivolous. 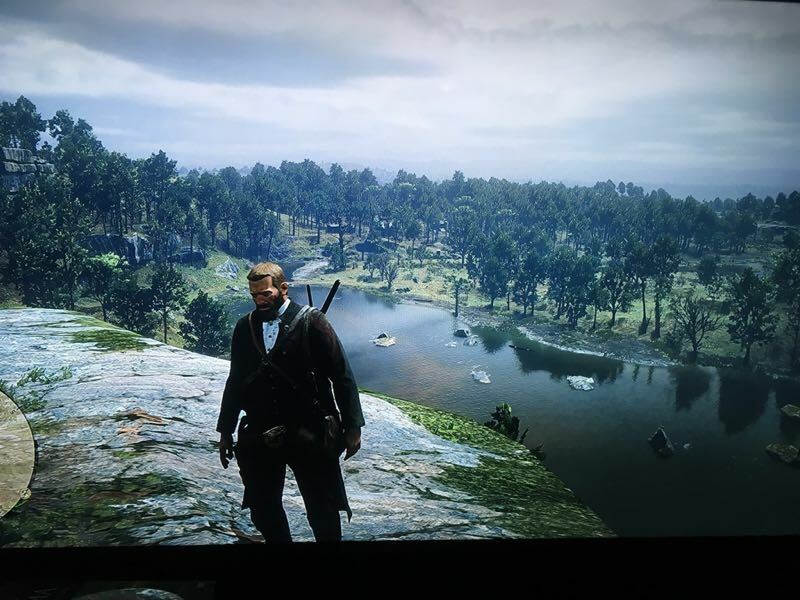 My favorite quest so far was going to the bar with Lenny. I laughed and found myself falling for these guys. They clearly love each other. To get to be a part of this is just a new experience for me in a game. I feel like me and Lenny are best mates. I want to go drinking with him again and get up to some more crazy antics. So why do I feel guilty when I don’t play? Well, that happened on a particular quest wiht Hosea. He’s a nice enough, criminal old guy who also wants to settle down. He respects Dutch but tries to influence him and get us to quit the life. I respect him for this too. He asks me to go hunt a bear. We go hunt a bear. 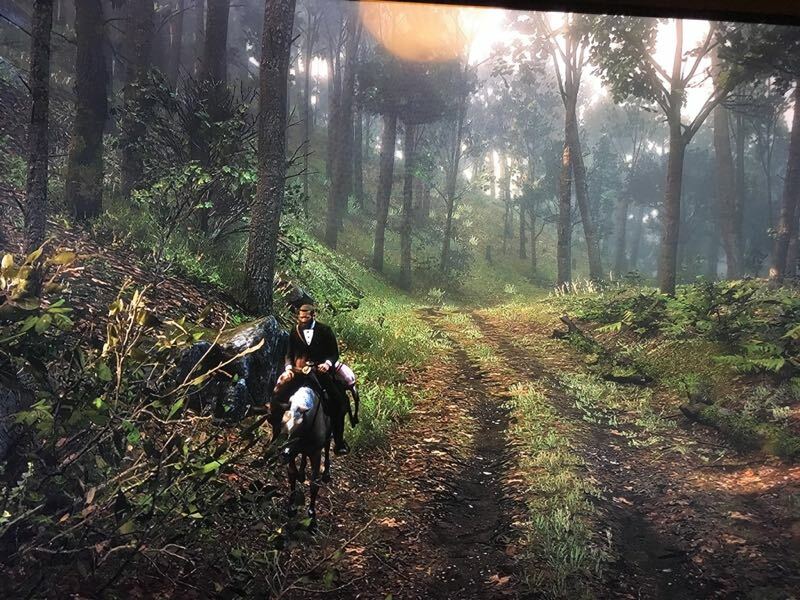 Halfway through the hunt, after we start stalking it, Hosea bows out. He’s too old for this, and heads home. I let him go off alone and finish the hunt. The bear mauls me to bits in a terrifying, Revenant-style battle. But I get him. I get his skin. I have to break from play and can’t get back to it for a few days. In those days, I start to feel guilty. I’m worried about Hosea. Is he OK after bowing out? I want to sell my bear skin and take some money back to the camp, to make my contribution. I want to check in with everyone and do my part for the family. What a strange way to feel! But also lovely. This virtual gang of criminals needed me, and I wanted to be there for them. I still get it now, if I stay out questing for too long out of camp. I want to go back and check in. Make sure everyone is OK.